A small flock of sheep made their way across London Bridge this week as the Freemen of the City of London exercised their ancient prerogative to drive sheep over the span. A reported 600 Freemen from the City’s 110 livery companies took part in the annual drive along with a score of sheep – all in an effort to raise for the Lord Mayor’s Appeal. 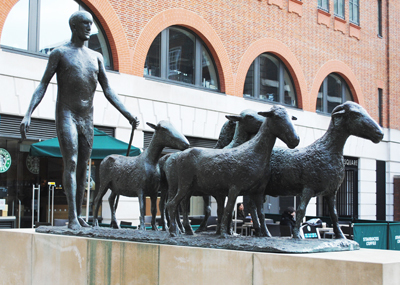 There’s a permanent reminder of the tradition of driving sheep in the heart of the City in Paternoster Square near St Paul’s Cathedral where Dame Elisabeth Frink’s bronze sculpture of Shepherd and Sheep can be found (pictured above).